Interval training is an extremely potent training technique that will improve your endurance racing performances. It’s also widely avoided by recreational endurance athletes because many consider it too complex or too hard. This should not be the case, and endurance athletes, runners, cyclists and swimmers of all levels can utilize this mode of training to significantly improve their fitness and competition performances. 1. Improves competition - IT simulates the stress of race pace and conditions athletes for competition. 2. Improves Neuromuscular Coordination - Your nervous system gets used to running at a faster pace. 3. Less lactic acid accumulation at a given pace - IT trains the athlete to run faster and accumulate less lactic acid at a given pace. 4. Thermoregulatory system is not as stressed - Body heat does not accumulate as rapidly as during continuous running. 5. Runners of all abilities can use it - Joseph and Kimberlie Nitti, in their book Interval Training for Fitness write, “Interval training can benefit almost any health person, from beginning exercisers to world-class endurance athletes”. Defined as “repeated bouts of high intensity activity, each followed by a limited rest period”, interval training involves running, swimming or cycling a short distance repeatedly, at a speed that is always greater than could be sustained continuously for the full session. In other words you swim, run or cycle shorter bursts faster than you would race, with much slower recovery intervals between these fast bursts. This is how it gets the name “intervals”. And by manipulating the length and speed of the recovery interval we create the desired training effect. e.g. short recovery intervals create an oxygen debt, enabling us to tolerate more lactic acid, so we are better prepared for races. It’s critical that you recover completely between interval workouts so your energy reserves are replenished and your muscle tissue has time to recover and rebuild. Adjust your recovery interval distance to get the desired training effect for your racing distance. You should be able to complete your workout feeling like it was a challenge, but attainable. Interval workouts should not become the focal point of your weekly training program--avoid becoming over competitive with yourself. Figuring out the details of your interval workouts can be tricky; you’ll need to use the acronym DIRT to help, where. . .
D = Distance of each fast burst I = Interval, or length of recovery (jog, walk, swim or cycle) between fast bursts R = Repetitions. How many fast bursts we do in one session. T = Time for each fast burst. This is an especially appropriate acronym--you’ll feel like dirt if you miscalculate any of these factors. We’ll use distance running to illustrate the physiology of interval training. And for general fitness buffs, the “Table for Suggested Workouts for Beginners” can be used for good result. The fast bursts in an interval workout need to be long enough to dip into the aerobic system--that is, they should be 3-10 minutes long. Because of the precise nature of the distances and times you’ll be running, interval training is best done on the 400-meter track. Walking or jogging, or a combination, is recommended in the interval between fast bursts. Your goal is to adapt to the interval workouts by attaining the maximum number of repetitions over these distances. Then, for continued improvement, speed up the fast burst, or decrease the recovery interval between them. Decreasing the length of the recovery interval between fast bursts achieves great results. Your body eventually adapts by generating smaller amounts of lactic acid at the same pace, enabling you to cruise at a “higher wattage”, or a much faster pace with less lactic acid building up. R = Repetitions: How Many Fast Bursts should You Do in an Interval Workout? 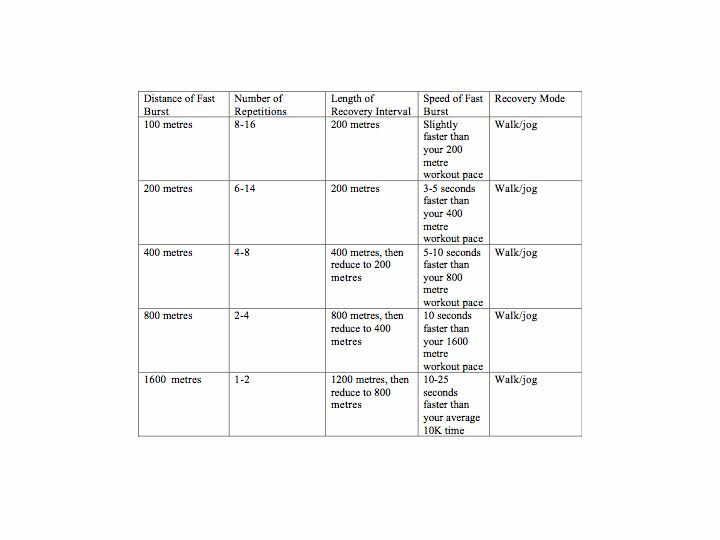 The cumulative distance of the fast bursts in your interval workouts should add up to 1.5 to 2 miles for beginners, 3 miles for experienced runners. For example, a session of 8 times 400 meters should be the absolute maximum number prescribed. You might start with 4 repeats of 400 meters, adding two to that workout next time you do it. Once you reach 8 or 10 x 400 meter repeats comfortably, for example, you can pick up your pace by about 2-3 seconds for following sessions. The longer the fast bursts, the slower they need to be because of our limited ability to supply oxygen to the working muscles and to disperse fatiguing by products (such as lactic acid) as they build up. If you do mile repeats for example, they should be done 10-25 seconds faster than your average 10K race pace, or slightly faster than your average 5K race pace. For the speed of other track interval workouts, see the table below. Let’s look at a runner trying to break 40 minutes for a 10K race. 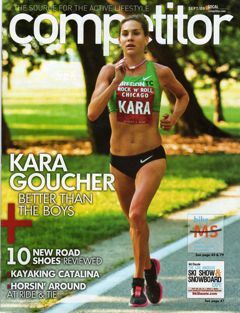 He or she needs to average under 6:27 mile pace, so 1600 meter (one mile) repeats should be done at around 6:10 pace. Start with 1 of these and build to 2, then 3. How Much Time do you need to recover from an Interval Workout? Because of the high risk of illness or injury it’s critical for you to adapt to your interval workouts, rather than let them flatten you. Allow at least 48 hours between these high intensity workouts, and if you’re over 30 years old, one interval workout a week is sufficient. If you are running faster than your previous times for 2-3 consecutive workouts, it’s time to ramp up your pace. When you can comfortably perform the workout, it’s time to increase the pace or decrease the recovery interval. A good warm-up is critical before interval workouts. A solid 15-25 minute jog with stretching and some fast “stride-outs” of up to 50 meters should be included in the warm-up. With these “stride-outs”, you pick your tempo up to a medium-paced sprint to prepare you for the fast interval bursts. Your interval workout should not be so exhausting you cannot recover for the next day’s training, which should be a slow recovery jog on a soft surface. Most important of all is that you have an adequate aerobic conditioning base before you attempt interval training. I’d suggest 8-10 weeks of steady state, aerobic running to prepare you for the rigors of interval speed work. Interval Workouts for Swimmers and Cyclists? Interval training is an integral part of swimmers’ and cyclists’ preparation for racing. For D.I.R.T. guidelines for these sports, find a good local coach to help you establish these workouts. Good luck with this fast training, and remember when in doubt, slow down the pace, or consult with your coach or a runner who is experienced in using interval training.